Kempo originated in China by Daruma Buddha in 525 ad. Daruma was originally from India, but moved to China to teach Buddhism. He originated Kempo to teach a method of self-defense to the villagers, who were being robbed and brutalized by Canton warlords and bandits. He felt fighting was wrong, but he felt not being prepared was worse. He fasted and meditated for many days until he came up with a fighting system. He called it Go Shin Jutsu Kenpo Karate, which means The self-defense art of the open hand. His new fighting system turned the villagers' bodies into weapons....hands, feet, elbows, knees, even heads. display of this single priest that they requested tutelage in this martial style as a means of protection. In later scripts, the kanji for this fighting art was recorded & pronounced as “Kempo” meaning “Fist Method” or "Law Of The Fist". In 1920, at the age of 3, a young boy named James Mitose was sent to Japan to be given a formal education and upbringing. While there, in addition to his normal schoolwork and university studies, he trained in the art of Kempo. Kempo had been brought over to Okinawa from China and had grown with great popularity. After training in Kempo for 17 years, he returned to the United States on February 25th, 1937, arriving in Honolulu Hawaii on the SS Tatsuta Maru at the age of 20. There he continued to train and in 1942 he set up a martial arts school. He gave the style he taught a number of different names during his lifetime including “Shorinji Kempo” & “Kempo Jujutsu”. William Kwai Sun Chow was born July 3, 1914, the third child and first son to Sun Chow Hoon, also known as Ah Hoon Chow and rose Kalamalio Naehu. After his mother’s death in 1925, Professor Chow dropped out of school at the age of 11, having completed only the 6th grade. William Chow learned to live on his own while drifting from one friend and relative to another. One of his more influential friends was that of James Mitose. With that friendship and time on his hands, Professor Chow trained and refined the techniques learned & taught by Mitose. Chow was a firm believer in the martial arts and more specifically, Kempo, have a sole purpose of combat and warfare with less emphesis on spiritual enlightenment. With this appreciation and blend of these complimenting sytles, it's understandable to hear Kajukenbo referred to as the truly original American Mixed Martial Art. Adriano Emperado, the founder of the Kajukenbo Self-Defense Institute of Hawaii, was born in Honolulu on June 16th, 1926 in the small community of Kalihi, which was and still is a part of the Kalihi-Palama District of the City and County of Honolulu. Adriano was one of seven children. There were three boys (Larry, Adriano, and Joseph), and four girls (Ella, Dechi, Nancy, and Connie Marcella). Like a lot of poor neighborhoods around the world, Kalihi and the surrounding area was a violent place to live. Because of this, Adriano started learning how to defend himself at a very young age. His father had been a professional boxer in the Philippines and in Hawaii, fighting under the ring name of Bulldog Panis. Adriano's uncle had also been a professional boxer. So by the time he was 8 years old he was getting some much needed exposure to western boxing. Professor Emperado received much of his martial arts training from Professor K.S. Chow and Professor James Mitose. Between the years of 1947–1952, he was part of the Black Belt Society that developed the art form currently known as KaJuKenBo. During these years Emperado together with 4 other masters of their respective arts developed KaJuKenBo to complement each others styles, to allow effective fighting at all ranges and speeds. It was decided that Kem(n)po would be the scaffolding, around, which KaJuKenBo was built. To test the effectiveness of their original techniques the five founders would get into fights around Palama settlement (the worst slum in Hawaii, at the time). If the technique succeeded consistently in street fighting, it was kept as part of the system. From these field test came Kajukenbo. Clarence Chang (Sil Lum Gung Fu or Chinese Boxing). In 1952 KaJuKenBo became a popular & feared art. In Hawaii it evolved into a very powerful and violent fighting style. Kempo/KaJuKenBo fighters had the reputation of training and fighting the hardest of all the martial arts. Kempo fighters were known to develop an "animal" instinct through their hard and sometimes brutal training methods. From then on it was known as the meanest martial art practiced. It's reputation became known world-wide, and people the world over wanted to learn the new and improved Kempo from Hawaii. Only a few top martial artists including Walter Godin (also trained by Chow) were taught this new art form in the beginning. Then in 1950, Adriano Emperado and his younger brother Joe began teaching the new art in an open class in 1950 and called their school the Kajukenbo Self Defense Institute (KSDI). Godin said, "There are no words to describe the training sessions at Palama Settlement during the early days, unless you've experienced it, only then will you understand." Joe Emperado and Godin became best friends. Joe would often take him to secluded parks and practice self-defense that nobody else saw. Then he would "tell me to remember the techniques." While Joe’s back was turned, George Shimabukuro stabbed him from behind. At that time, Joe did not even know he was stabbed and thought he was hit by a very hard punch. The next attack thrown was a strong hammerblow from Joe that knocked his attacker into parked cars. The fight continued with Joe Emperado squaring off with an armed George Shimabukuro while Godin took on the other two guys. Unfortunately, Shimabukuro avoided jail time in Joe Emperado’s death. The claim of self-defense was allowed since Joe was well known as a dangerous martial artist (plus it was probably hard to determine from the multiple stab wounds examined during the autopsy when the first stab occurred). Some people even considered Godin to be a coward. Could this be true? Godin went on to become one of Kajukenbo’s top students and chief instructors who was promoted to a level that clearly recognized his position. He was also Emperado’s bodyguard. If Emperado thought Godin was a coward, neither of these things would have happened! Godin left California and started Godin’s School of Self Defense in Kaimuki, Hawaii. He began teaching Chinese Kempo Karate in 1961. Around this time, Godin also went back to training with Chow, who was teaching Kara-Ho Kempo, and studied Hawaiian Lua with Brother Abe Kamahoahoa. On December 16, 1973, Chow promoted Godin to the rank of Professor. Godin trained lots of martial artists including John Hackleman, Eugene Sedeño, Delilah Godin, Bill Takeuchi and David Tavares. Godin continued to teach and operate the only standing school in the Palamas Settlement until his recent passing on August 7, 2001. John Hackleman is one of the greatest Kickboxers to ever step into the ring and still holds titles in many Kickboxing associations. Hackleman was officially promoted to the rank of Professor and 10th Degree by Walter Godin on July 15, 2000. Hackleman is now head of Godin’s Ohana, an organization that recognizes the impact and contributions by Godin to the art of Kempo, and operates The Pit out of Arroyo Grande, CA. GrandMaster John "The Train" Hackleman is a 10th degree black belt in Kempo, and has been teaching Karate for nearly 40 years. He is more commonly known simply as "PitMaster". John is the current W.K.A. North American Champion, Pacific Heavy Weight Champion, and is ranked #5 in the world. John has a 58-6 record with 42 KOs, including nine Nationally Televised bouts. As well as fighting for for Don King, John has fought and trained all over the world. He has had 20 pro boxing matches and has worked with the world's best. John was known for his conditioning and vicious punches and kicks. He retired with two championship belts. John was promoted to GrandMaster by our systems founder, Adriano Emperado. Words can not descbribe what an honor this is. On this same day, he was also promoted into the Blackbelt Hall Of Fame. Adriano Emperado wanted the world to know the impact that John and The Pit's Hawaiian Kempo has had on in martial arts world and that it is to be respected and recoginized with the greatest respect possible. The very principles that the Emperado's KaJuKenBo were based on back in 1942 are exactly the same principles that we follow today in our training at The Pit with evolution being the constant. 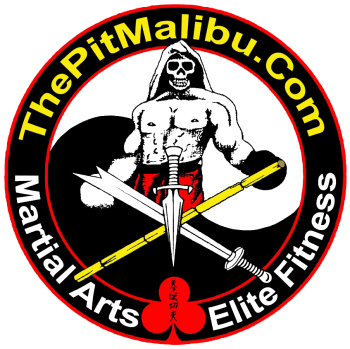 The Pit was started in 1985 in Woodland Hills California because we wanted to create a place for people to learn a no nonsense martial art and conditioning program. Some of the world's best fighters have trained at The Pit including our own Chuck Liddell. All that is asked is that you give our Hawaiian Kempo and The Pit the respect and loyalty it gives you. Confidence, loyalty, and humility are what I expect from all of our students". Kumu Rick Metzler is a 8th Degree Blackbelt in The Pit's Hawaiian Kempo under the world-renowned fighter & mixed martial arts trainer, Grandmaster John Hackleman. Kumu Rick is also a 3rd Degree Blackbelt in Cacoy Doce Pares Eskrima (Filipino stick & knife fighting) & 3rd Degree Blackbelt in Cacoy Doce Pares Eskrido (Filipino stick submissions) under the 5 Time World Champion Full-Contact stick fighter & Grandmaster Anthony Kleeman. In 2010 Kumu Rick was inducted into the Cacoy Doce Pares World Federation Hall Of Fame where he was awared this honor in Cebu, Philippines by Supreme GrandMaster Cacoy Canete. Rick spent 9 years training and fighting for The Pit with an undefeated boxing & kickboxing record before earning his Blackbelt in 1996. Since then he has also gone back to his KaJuKenBo roots in earning the rank of Blackbelt in Cacoy Doce Pares Eskrima, Eskrido & Pangamot as well as being asked to join the USA Full Contact Stickfighting Team competing in both Los Angeles and Cebu, Philippines where he won the Bronze medal. Rick has taken his 30+ years of training and fighting for The Pit and combined this with the Filipino fighting concepts and weapon awareness that his Blackbelt ranking in Cacoy Doce Pares brings to the table. Our KaJuKenBo roots were established under a simple philosophy of, “use what works and discard what doesn’t.” Whether you are training for a martial arts competition or cross training for any other sport in the world, the workouts and overall philosophy you'll find here at The Pit will get you closer to your goals of ultimate fitness and conditioning and get you there while making friends and having fun. Having fun & staying healthy is key to longevity in the martial arts and if you can do that while "filling your toolbox" with tools that will actually work in real life situations, then you have yourself a system that is worth your time and effort to learn. The Pit's Hawaiian Kempo combined with the Cacoy Doce Pares and Brazilian JiuJitsu creates a blend in concepts and techniques that result in a training method that assures you that there is no wasted effort. What is the origin & meaning of "Karate"? Karate is used as a generic name for a large number of different Japanese and Okinawan fighting styles. There are many different descriptive names added to karate to describe either its master or its philosophy or its particular fighting specialty. Regardless of how the style is described, its roots trace themselves back to Chinese fighting techniques. The word "karate" reflects this origin. "Kara" is an ancient term for China and "te" means hand. In the Okinawan language, "karate" means China hand or hands from China. This showed respect from where the movements and knowledge originated. After the Japanese people also began to incorporate the Chinese fighting styles, they changed the written character of "kara" from China to "empty". In Japanese, Karate means "empty hand". What's The Difference Between Kempo And Kenpo? Nothing. Actually, the only difference is in the translation of the Kanji to its English form. The rules of Kanji hold that when a character (written word) ends in an "n," the "n" is pronounced, when spoken; with the exception, that when the "n" is followed by another character (word), which begins with a "p," the two characters are unchanged in the written form and the "n" is pronounced "m". Ken-po follows this rule. So, in following the these Kanji translation, it is spelled "Kenpo" and pronounced "Kempo". It is only in transliteration that Kenpo is written Kempo. Thanks to Mr. Will Tracy for the Kanji translation lesson! The words Kenpo and Kempo are both pronounced the same and both mean "Law of the Fist" or “Fist Method”. It's sort of like saying "Qi" or "Chi", "Gung" or "Kung." In Grandmaster Ed Parker's book, William K.S. Chow was noted as the first person to use the term Kenpo to show his break from the Mitose family Kosho Ryu Kempo. The current head of Professor Chow's system uses the "Kempo" spelling as did Professor Walter L. Godin. THE PIT used the “Kempo” spelling along with the preceding “Hawaiian” to show the lineage of our “Law of the Fist” coming from Hawaii. So in combining the understandings noted above for “Karate” and “Kempo”, you can see that the style of martial art that The Pit teaches of Hawaiian Kempo Karate” literally translates to "The Empty Handed Fist Method" or "The Empty Handed Law of the Fist".